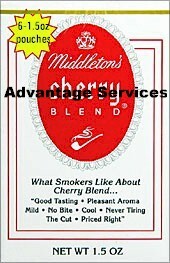 Middleton Cherry was the first blend most Americans think of when talking about cherry-flavored tobaccos. John Middleton Co, blenders of fine tobaccos since 1856, is best known for their Cherry Blend pipe tobacco. This old aromatic blend is a combination of aged Burley and Virginia tobaccos infused in a lush cherry casing, resulting in a tantalizing cherry-pie aroma that will have those around you running to the bakery.